Just posting an update to my religion post from 11/27. I have been busy so this took place about a week ago but I really want to update you all about it. As a quick preface, my wife and I spent our honeymoon in Hawaii back in June/July. We fell in love with Hawaii so much that we started looking for houses after the first week. When we came home, moving to Hawaii became almost an inside joke. We mentioned it and talked about how awesome it would be but that was it, which brings me to the heart of the story. My wife got home from work the other day and immediately suggested we go get sushi at a local restaurant. I could always go for sushi so I agreed. During dinner my wife just blurts out "I so want to move to Hawaii." Now we have been talking about this for some time now but we both cast it aside as wishful thinking. As soon as she said that I immediately put down my cup of tea and said "Oh god I want to move there so bad." Which started a lengthy discussion about if it was even possible. By the time our dinner was over we had a plan. Since she will be graduating college at the end of the summer of 2012, she will apply to graduate school in Hawaii. After she gets settled down there, she will start looking at houses for us and get the paperwork started to buy something. It's going to be a rocky road to move our lives out there but it will be so worth it in the end. So I wanted to write a quick update about what happened Thursday night, don't worry everyone it was all good. To be honest I was craving a diaper all day. I decided not one wear one last night because I don't want to overdo the whole diaper thing. Don't get me wrong, I would love to diaper up every day when I get home from work but I don't want my wife to get sick of seeing me in a diaper. I don't want her to come home one day and be like "you wearing a diaper again?" Thus ruining any future diaper wearing around her. For this reason I chose my diaper wearing sessions carefully. So onto last night. When my wife got home, about an hour after me, she suggested we go out to eat. My first thought was "great because I'm hungry", my second thought was "I'm so glad I didn't diaper up because I would have to take it off after just an hour". After a brief debate we decided on Piccadilly Pub, which is a great place to eat if you’re in or around Massachusetts. We had a couple tall beers at dinner and stopped for more beer and wine on the way home. When we got home we opened a couple more beers and sat down in the living room. I wasn’t paying attention when my wife opened her laptop but he next question peeked my interest to say the least. “So, do you go on this website?” She asked. I quickly spun my head around to see she had googled ‘diaper fetish’ and was clicking on the link to dailydiapers.com. “Yup.” I replied and a big smile came over my face. “There’s anime this site?” She said, confused. She scrolled to the bottom to see the two diapered characters then clicked over to the picture galleries. I proceeded to explain the pasties and drawings and the 19000+ free pictures but she didn’t click on any folders to actually see the pictures. She instead clicked back to the homepage and then onto the dating website where she found the “hot or not” section and went through a bunch of those. Unfortunately for us both, they were mainly pictures or old men. She then went back to the search page and clicked on diaperspace.com. “Are you on this one too?” She asked. “Yup.” I replied, but I was a bit nervous. “Na, that’s fine.” I replied, I logged in. She was excited about it and I was excited to get out of the room. I had nothing to hide but I so far she has seen me in a diaper but she hasn’t seen my online presence. While I was searching for a marker in the office she called out to me. “Umm, yeah, I told you that. I like blogging and stuff.” It dawned on me that I may have never told her about this very blog…oops. When I got back to the living room she asked if she could read it. “Of course, go right head.” I read every word as she did expecting for some comments but she didn’t say much. She did playfully poke fun at me for various aspects of my short story I posted. It was all in good fun though. We she was finished reading every post I made she told me to turn over so she could draw on my diaper. I gladly turned over and she jumped on the back of my knees and started drawing. When she was done it happened to be way past my bedtime. After talking about how much it sucked because we both wanted to stay up longer she decided to start drawing on the front of my diaper as well. The night ended shortly after and I know that it will be just as hard to throw this diaper out as it was to throw out the last one she drew on. But I will always have the pictures. I've been in a funk lately. 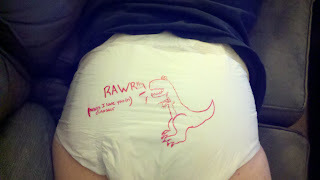 Not only have I had no real interest in wearing a diaper for a while now, but I have been in a general funk lately. I really haven't felt like myself in a while and I have no idea why. Thankfully I have overcome the binge and purge cycle with regards to my infantilism paraphernalia. Which brings up an interesting and much talked about topic, the binge and purge cycle. Why do we binge and purge? Why do we feel the need to throw everything away? Sometimes it gets to a point where I just feel disgusted about the whole situation and I feel ashamed for enjoying a nice thick diaper. Sometimes the last thing I want to see is a diaper. I think it stems from caring so much about what others think of me. I get disgusted at myself for liking diapers because I think about what so and so would think of me if they saw me in a diaper. I have this problem with my wife sometimes. If you're an avid reader of my blog then you know that my wife supports my diaper wearing and has even worn herself for me, but I am still not fully comfortable with her seeing me in a diaper. She has told me many times that I have nothing to worry about but that doesn't help. When I was younger I would get this feeling and end up throwing away my stash in disgust, like I'm sure many of you have. Eventually I got to a point where I didn't have to throw everything away, all I had to do was stuff everything deep down in the back of my closet where it was out of site and out of mind. I hope that someone reading this topic will find that metaphorical closet to stuff everything into until the feeling of disgust and shame pass. It will save you a bit of money in the long run. I have had a lot of free time on my hands lately. Now when I say "a lot" I mean A LOT! One of the perks of working where I do is that we all but shut down for about 3 weeks around the end of the year. There are still a few office workers holding down the fort for all but Christmas and New Years, but I'm not exactly an office worker so I get to take my vacation time during those 3 weeks. After all this time off I tend to get bored, which brings me to the topic of my ramblings. I started watching the show Dexter on Showtime. If you haven't seen up to the end of the second season of this show then stop reading, there may be spoilers ahead. And if you haven't seen the show I would highly recommend it, it's one of the better shows I've seen in a while. Now that you are still with me, I wanted to write about this subject because I have been feeling a connection with Dexter since I started watching a week or so ago. Let me start by saying I AM NOT A SERIAL KILLER! That is not the connection I feel to him. The connection I feel toward him involves his burdening secret he has to bear. I too feel like I have a secret hidden inside me that wants to leap out. I feel it stirring and churning down in a place that I want never to see the light of day. The secret, as many of you could guess, is my infantilism. I know many of you fully embrace this side of yourself and you wear secretly in public or you have come out to your family and friends and wear openly 24/7, but I don't. I don't want to be that kind of person. I want to be a normal boring person with no fetish, no secret life. This normality I seek is what brings me close to character like Dexter. He, of course, is a serial killer. This is definitely not something that can be brought out into the open without an instantaneous halt to all things related to his desires, not to mention a one way ticket to the electric chair. Yet despite the consequences of outing himself, Dexter decided to come clean during episode 11 of season 2. Throughout the episode he mentions how much of a relief it is to just imagine telling everyone and coming clean. He hasn't even told anyone yet and he is already feeling relief from lifting the burden off his shoulders. I felt that same relief when I told my wife. The knowledge of who I am wells up inside of me like a backed up toilet on the verge of spilling out. It's strange for me to be out in public sometimes. I feel like I'm out of place just like Dexter has throughout his life. Sometimes, of course, is the important point in all this, I don't always feel like this. I do, however, understand what Dexter is going through. Obviously coming out to my friends and family would not lead to something quite as severe as a electric chair but, I care deeply what others think of me. I really wish I didn't but there isn't much I can do about that, it's how I was made. Being ousted for what I am would destroy some people's visions of me. Even if it didn't, the thought of my parents knowing or my sister, would be a lot to bear. For this reason, I must stay hidden. I must accept who I am and I must hide it from everyone. I told my wife and even that was hard to do because I desperately want to keep this to myself. Diapers are very personal for me which is why it's hard to wear in front of my wife sometimes. It's why I am self conscious if my diaper crinkles excessively. 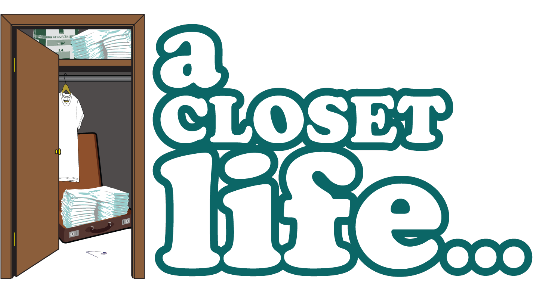 I will gladly keep this closet life in the closet forever not matter how tough it can be.